I found these and also some other items from Fida-charity shop in Nokia. * Black velvet shoes are made by Nokian Footwear. They are meant to be used at home as slippers, but maybe I'll use them also outdoors. I planed that I change black tassels to red, felted wool hearts. My grandma has in storage those tassels also in other colours. She worked in Nokian Footwear almost her whole life and in old days they got from factory shoes and "replacement parts" to those. Name of these slippers is Kodikkaat, which means homelike or homely. 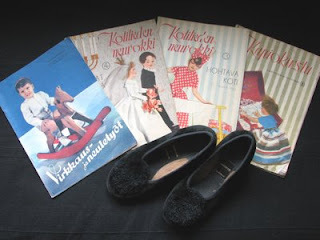 Because I'm born in Nokia I've also traditional Aino-slippers :) Those I use only at home and my dear son has ripped tassels from those when he was baby. And I dream about pink Reino-slippers :) My son of course has traditional brown Reino-slippers. * Magazine on the left is Crochet- and Knitting Works, winter issue from year 1954. Patterns are of course lovely, but I also like very much those old advertisements. In year 1954, at least in Finland, was normal to use that N-beginning word which mean black people. 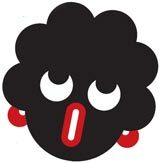 In this magazine is knitting pattern to "Little N.... Doll" It looks quite similar with this licorice figure. That figure were used from 1921 to 2007 and nowadays it looks like this.